Artist Nikolai Ge. 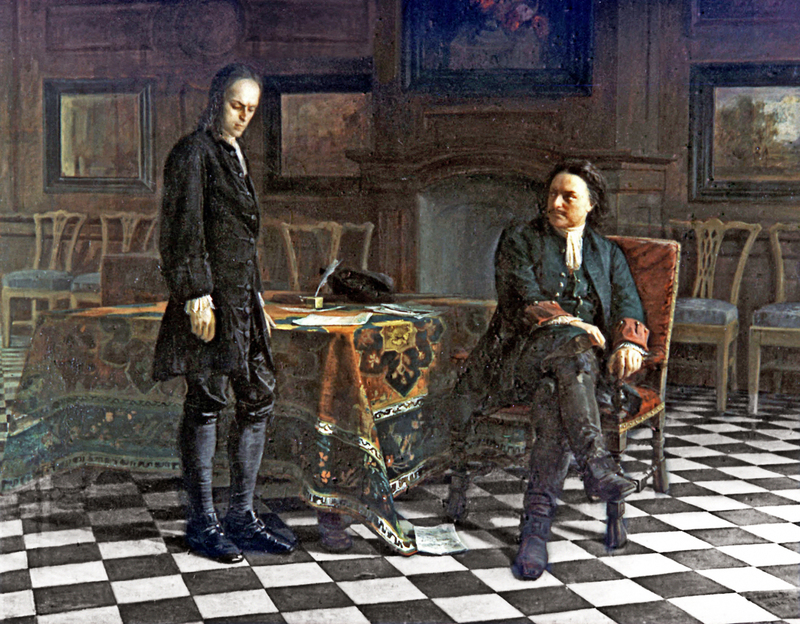 "Peter the Great Questioning Tsarevich Alexei in Peterhof," 1871. The State Tretyakov Gallery in Moscow. Exactly 300 years ago, on Nov. 21, 1716, Tsarevich Alexei, who was weak and distanced from his father's views and reforms, asked Austria for political asylum. However, he was eventually forced to return to Russia, where he died in prison, accused of planning to overthrow his father. But was he really a threat? Russia's first emperor Peter the Great was famous not only for his wars, radical reforms and the construction of the new capital, St. Petersburg, but also for his temper. He worked tirelessly, demanding the same from his comrades, and he was terrifying when he was angry: Not only was he capable of beating anyone who irritated him, he could also have them executed. Everyone was afraid of falling out of favor with him, including his family. Someone who was constantly out of favor with Peter was his firstborn child Alexei, who was born in 1690. His mother, Peter's unloved wife, was sent to a convent, and he lived his first 19 years in Moscow, far from his father. Alexei was surrounded by aristocrats who were skeptical towards Peter's reforms. Occasionally the emperor would give him assignments, such as preparing Moscow's defenses in the event of a Swedish invasion, but was always unhappy with the results. According to the tsar, he not only scolded his son, but also "beat him with a stick." The tsarevich was very afraid of his father, so much so that once when Peter wanted to test him, Alexei preferred to injure himself by shooting his hand rather than fail the test. Peter despised his son and could not come to terms with the fact that he would inherit the empire. Nevertheless, by right of birth Alexei was still Peter's official heir. The tsar was burdened by this situation, especially since his new wife, the future Empress Catherine I, had borne him a son in 1715. Historian Mikhail Ryzhenkov writes that in that year Peter publically handed Alexei a letter in which he rebuked him for "not being interested in the affairs of state" and offended him, threatening to deprive him of the inheritance. Frightened, Alexei wrote to his father saying that he was willing to voluntarily renounce the crown and take vows, but subsequently fled to Europe, stopping in Austria. Vice Chancellor von Schönborn of the Holy Roman Empire later remembered that in November 1716 the fleeing Russian tsarevich had barged in on him and begged him to persuade Emperor Charles VI to permit him to stay in Austria. "He will save my life. They want to kill me," Alexei is reported to have said. Charles gave him asylum but, as Ryzhenkov writes, decided to use him as a pawn in a political game. Together with his mistress Afrosinia, a former serf, Alexei first lived in Ehrenberg in Tyrol, southern Austria, and then in Naples. It was there that in 1717 Peter's envoy, an experienced diplomat by the name of Peter Tolstoy, found him and gave him the tsar's message, admonishing him to return to his homeland. Peter promised to pardon his son: "You will not be punished. I will show you my best love if you abide by my will and return." Alexei refused, fearing his father. Then Tolstoy bought off an Austrian official who lied to Alexei, saying that the Holy Roman Emperor was willing to extradite him to Peter. Feeling cornered, the tsarevich decided to return. At first Peter indeed announced his reconciliation with the tsarevich, although ordering him to renounce the throne for himself and his heirs. Alexei renounced it happily. "Thank God I have been deprived of the inheritance!" Alexei wrote to Afrosinia. "God grant us to live happily in a village." But Alexei's dreams did not come true. The authorities began an investigation into his escape to Austria and he was accused of a conspiracy against Peter. During an interrogation Afrosinia testified against the tsarevich. After torture Alexei confessed to everything. He was sentenced to death for trying to overthrow Peter "not only through mutineers but also through foreign help." In June 1718 the tsarevich died in prison, not waiting for the execution of the sentence. A conspirator or a victim? It is unclear how valid Afrosinia and Alexei's testimonies concerning his participation in the conspiracy were, since they were extracted through torture. There is no other proof of his guilt. Mikhail Ryzhenkov doubts that the tsarevich was guilty. "The fact that in Vienna Alexei was considered an important figure in the political game does not mean that the tsarevich was asking for armed assistance against his father." It is possible, notes the historian, that Alexei's escape to Austria served as an occasion for Peter to free himself for good of his undesirable son. Paradoxically, this did not bring the royal dynasty any peace: Peter the Great died in 1725, not having appointed an heir, and until 1801 the House of Romanov was mired in a swamp of palace coups.